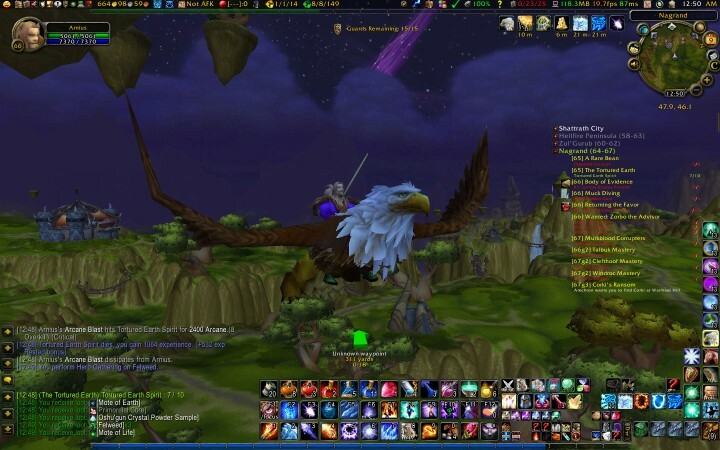 My main, Arnius (human mage, Madoran US), flying over Nagrand. I started playing World of Warcraft in January 2009. Though I've created a number of characters since I joined, I've mostly settled on a few Alliance characters on the Madoran (US) realm and a few Horde characters on the Zangarmarsh (US) realm. Despite being in game for almost two years, I have no max-level characters, for several reasons: I was a serious altaholic in my early months; my interest in playing has waxed and waned (I've played intensively during some weeks or months, and hardly at all during others); and I've liked to stop and smell the mageroyals along the way. Character pics and more information are at my Wowpedia user page.